Many Americans will face hard times for a long time to come. 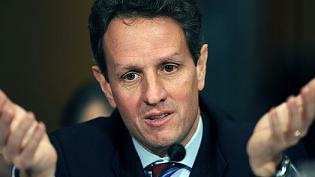 Geithner says will be some time before many people feel like the country is recovering. Of course, Geithner is a large part of the reason that it will be so hard. Geithner has been a big part of the problem. In Geithner’s own words during confirmation hearings in March: “First of all, I’ve never been a regulator…I’m not a regulator.” According to the New York fed bank’s Web site, that was your job!! Quoting from the Fed’s website: “As part of our core mission, we supervise and regulate financial institutions in the Second District.” That district of course is the epicenter for bailed out banks and billion dollar bonuses. It’s “deeply unfair” that some financial institutions that got taxpayer-paid bailouts are emerging in better shape from the recession than millions of ordinary Americans. Geithner also argued that President Barack Obama had no choice when confronted with a financial crisis. Moreover, it is not like their approach fell on them and they couldn’t do anything about it. Geithner … and the boys made a conscious decisionto side with the oligarchy at the expense of the people. [There was a] point at which the government had to decide if it would defend the financial oligarchy from populist outrage, or whether it would reform the financial system that brought us the financial crisis and severe recession. We do not think it was an easy choice. But ultimately Obama and his advisers chose to bet on the bankers they knew. The result has been even larger banks and an even more concentrated financial sector. Indeed … too bad that Geithner and the boys are still encouraging that kind of risk-taking. Geithner was, of course, largely responsible for much of the failure of the government to restrain risk-taking in the first place. Mr. Geithner, as President of the Federal Reserve Bank of New York since October 2003, was one of those senior regulators who failed to take any effective regulatory action to prevent the crisis, but instead covered up its depth. Geithner was also complicit in Lehman’s accounting fraud [and seethis]. And pushed to pay AIG’s CDS counterparties at full value, and then to keep the deal secret. And as Robert Reich notes today, Geithner was “very much in the center of the action” regarding the secret bail out of Bear Stearns without Congressional approval. Geithner has been equally bad as Treasury boss. Indeed, there is hardly a single independent economist who thinks he has been responding appropriately to the economic crisis. Sorry to say, but Geithner has long been a yes-man to the powers-that-be, who ships pallets of money wherever he is told without question or any follow-up or tracking whatsoever. Even worse, Geithner has been called an idiot by Nassim Taleb and a “con man” by Time Magazine. And because Geithner (along with Bernanke) have insisted that the big banks be bailed out at Main Street’s expense, that the status quo be protected instead of reformed, and that the U.S. insure the debts of the too big to fails, the next crisis will be even bigger than the last.